This HiRISE image ( PSP_002824_1355 ) shows a sand dune field in Rabe Crater. Rabe crater is approximately 100 km in diameter and is located in the southern highlands of Mars. The dune field within the crater has dimensions of roughly 50 km x 35 km, making it one of the largest dune fields in the region. It is composed mostly of barchanoid and transverse dunes that formed from uni-directional winds from the southeast. The sand grains are believed to be basalt, a common volcanic rock, that eroded from sedimentary units (made of eroded lava) exposed in a pit on the floor of Rabe Crater. 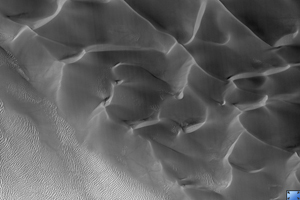 The dark toned streaks seen on the dune slip face in the subimage are believed to form from grain-flow events, or sand avalanches, that occur when wind carries sand grains over the crest of the dune and deposits them on the slip face oversteepening the slope. 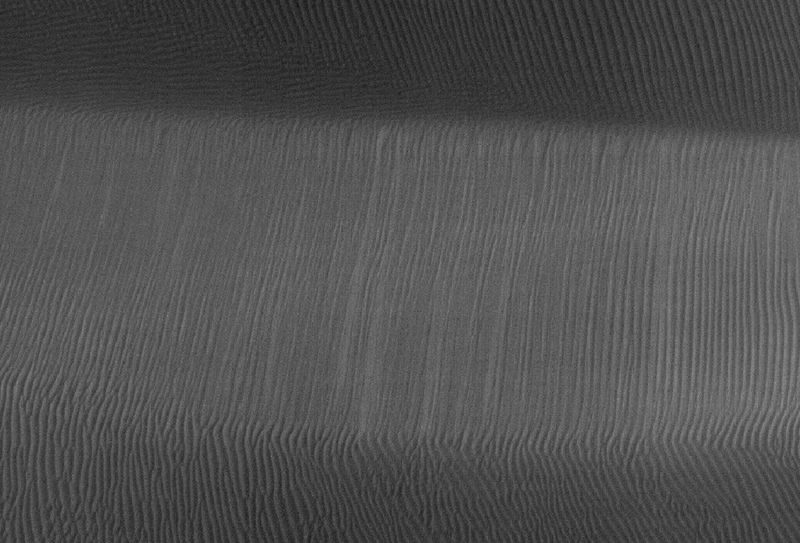 When compared with older images, the identification of new streaks in HiRISE images could indicate that these dunes are still active today. Also seen in the subimage are smaller secondary dunes superimposed on the surface of the large dunes.